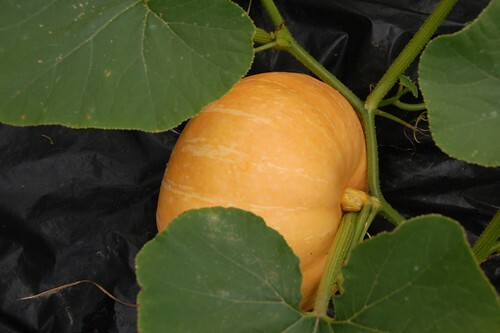 This squash came from a seed marked Pink Banana but I think its mother must have been playing around because this big strong fruit looks pretty much like Bix Max to me. Even though we haven't quite reached the equinox it's definitely moved on into autumn now. There have been gales and rain for the last few days and although a settled dryer and warmer ten days is now predicted it's a bit too late to hope for any more summer crops to mature without help. Just two of these from the one plant this year. I think they'll be o.k. but it's keeping the genepool small for the next generations. 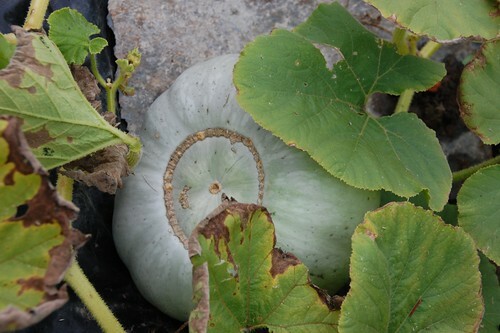 I'm hoping to be able to share some seeds from these Whangaparaoa Crown pumpkins. With luck there will also be some Irish Prean peas and I have a couple of heads of Babington Leeks bulbils if there's anyone left who doesn't have any by now. Watch out for a '2013 share' page coming soon with all the details. Small, late and neglected, sunflowers this year were a washout. 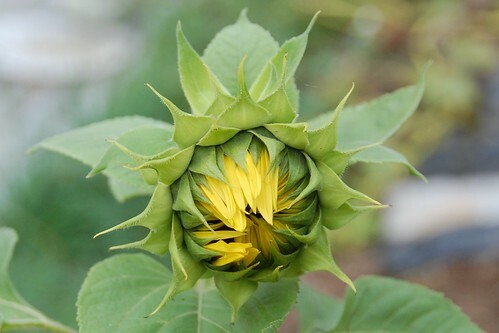 It was old seed but even so I was expecting better things from the small patches of sunflowers dotted around the place. The weather was good enough and this one in the back patch was watered all through the driest spells so I'm not sure what was wrong. Very disappointing, and this is the only one that's even come close to flowering yet. It was bound to happen. The deer have discovered that yacon is edible. They still don't think much of ulluco except as trampling space. 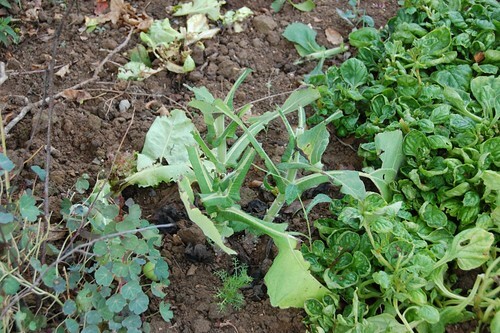 So we do still have naughty deer, the small sneaky sort who creep by in the night to nibble away on my precious vegetables but much as I wish them to the other ends of the earth I am a bit concerned that we've not heard anything from the Red deer so far this year. Usually by now they are preparing for the rut by bellowing out challenges and securing territory for the does but there's been nothing so far. Strange and a little worrying because the hunters are already on the job. 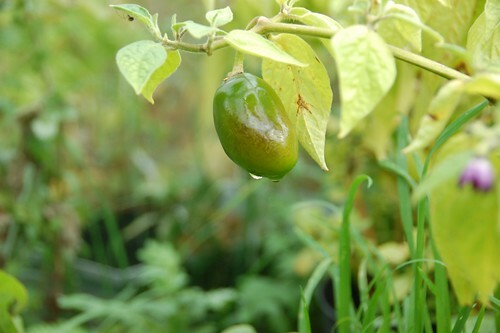 The Alberto Locoto chillies have formed fruit, but not a lot. The tree chillies came through the winter well and I thought they'd make a lot more growth this year but they are rather pot bound and the unexpectedly high temperatures don't seem to have been to their liking either. 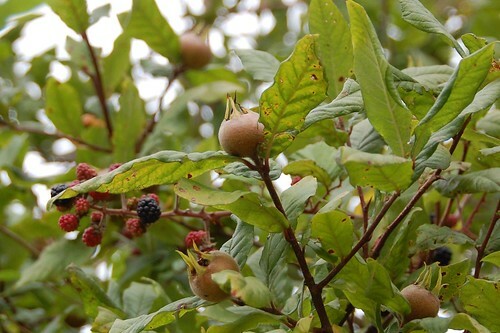 There are fruit forming and slowly acquiring some size and with luck they'll over winter again back in the UK where they can be better protected from the cold. I really want them to succeed - perennial cool weather chillies seem to me to be a much more perfect crop than ridiculously hot and finicky annuals. I'd like to find some other varieties too, they come in a range of colours from red to yellow and with various fruit shape and sizes. We've had such a good year for blackberries even the birds can't keep up and there are fruit mummifying on the brambles. I've been eating them raw, foraging as I wander around the garden but I've not bothered with jam or jelly as we still have leftovers from last year. The meldars are doing fine and will be harvested in November for jelly. We always manage to eat that. 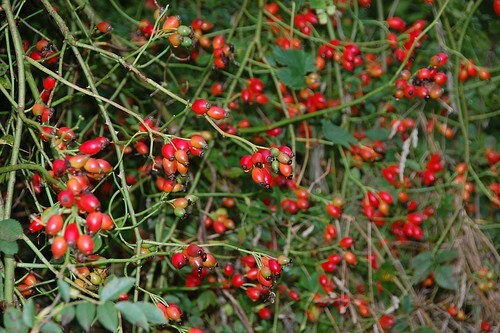 And elderberries are desperately in need of harvesting for syrup, as are the rose hips.